EDMONTON – After three years of questioning and evaluating itself, Concordia Lutheran Seminary (CLS) inaugurated a new curriculum this fall. What was wrong with the old one? In terms of theological content, absolutely nothing! The eternal Gospel we are called to preach remains the same. But our surrounding culture has changed so much, we needed new ways of presenting that unchanging Gospel to what is virtually a new world. One major change takes place outside the classroom. Since becoming a pastor involves developing character as well as mind, we have set up a “co-curriculum” to help CLS equip and evaluate students in non-academic—but essential—areas. Students earn units by participating in field education, workshops and seminars, and other events conducive to spiritual and personal growth. Developing a sense of servanthood is one important area, as are pastoral skills, worship skills and life skills in general. In the past generation we have moved from a culture that was at least nominally Christian to one that is purposefully multicultural. Religion is now seen as private matter of one’s own choice rather than something based on inherent truth—specifically, the inherent truth of God redeeming the world through His Son, Jesus Christ. This calls for an education that prepares pastors (and lay people) for speaking and confessing the Gospel in a culture that is increasingly indifferent or even hostile to it. New methods of delivering this education help extend our reach well beyond the campus. With instantaneous communication and live streaming, people living at a distance can listen and view lectures, participate in class discussions and deliver assignments. While we recognize that education takes place best in a community of Christian scholars, based on-campus, distance learning will also provide a way students can test the waters, to see if they truly have the aptitude for seminary and for ministry. Tradition once divided the curriculum into four fields: exegetical theology, systematic theology, historical theology and practical theology. CLS has noted that the division is somewhat fluid, that all of these categories overlap in many ways and the curriculum needs to reflect this. For example, a sermon needs to be relevant to people and well-delivered (practical), but it needs to be based on a thorough study of the text (exegetical) and reflect the truths of the Word of God that have been proclaimed through the ages in His church (doctrinal and historical). At CLS, “practical theology” has become “theology in praxis,” as we recognize that all theology is intensely practical, since it relates to the salvation of sinners and prepares the potential pastor and leader to bring the Gospel to bear on the lives of people in the pew and in the culture. Some courses have become explicitly trans-disciplinary and team-taught, to clearly demonstrate the importance of integrating the entire discipline of theology into a unified entity. 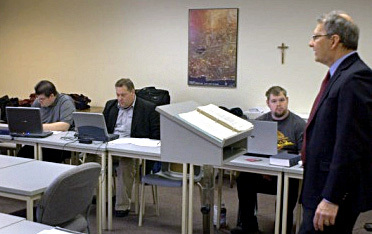 Regardless of the new curriculum, the central teaching at the seminary is still Scriptures as the Word of God written, the Lutheran Confessions as a true exposition and exhibition of that Word, and the proper distinction between Law and Gospel. Students continue learning the skills of preaching, teaching, counselling, and evangelism so they can relate to the people they will serve. And they are engaged with the church through field education experiences in area congregations. Rev. Dr. Edward Kettner is academic dean at Concordia Lutheran Seminary, Edmonton, Alberta.